To add your web forms to your website, you should first have them on your Zoho CRM account. Once you have generated the forms, here is how you can add them to your website. 1) Login to Zoho Sites. 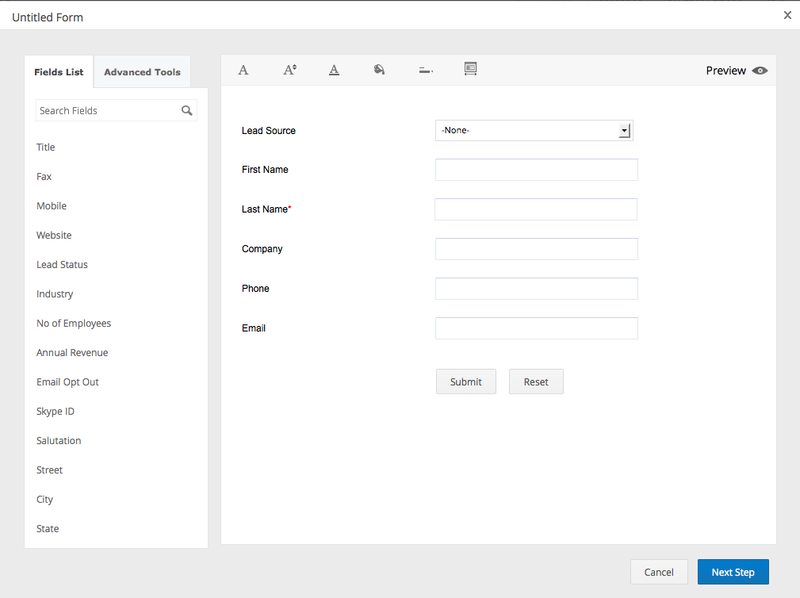 2) Under Form section look for Zoho CRM web forms widget, drag and drop it on your page. 3. A window will open up, instructing you to select a form that you want to add to your site. 4. Every time a record is created , an email notification can be generated. 5. Users submitting data into your form can also be redirected to another page, probably a thank you page. This return URL has to be specified in Zoho CRM. If you do not have any web forms on your CRM account yet, you can generate one now. Follow the following steps. 2. Click on the 'Settings' icon on the top right-hand side, and click on Setup option from the drop-down menu. 3. 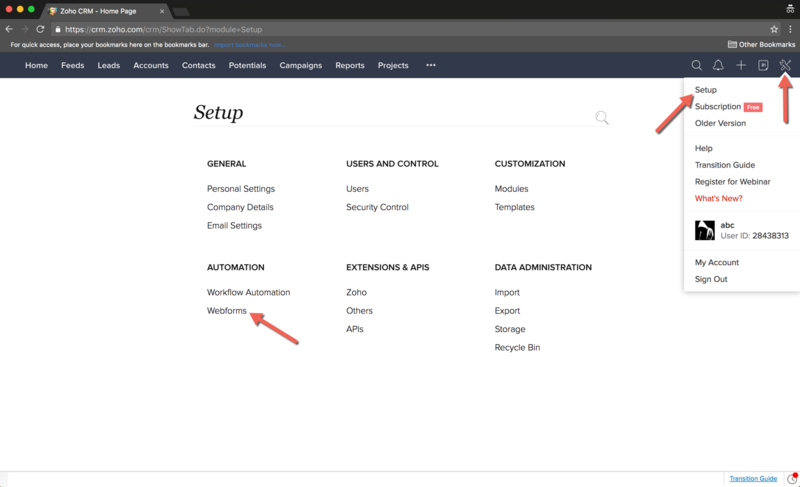 In the Setup section, click on Webforms under Automation. 4. This would redirect you to the Webforms section from where you can create new CRM Web Forms. 1. Click Settings > Setup > Web Forms. 2. 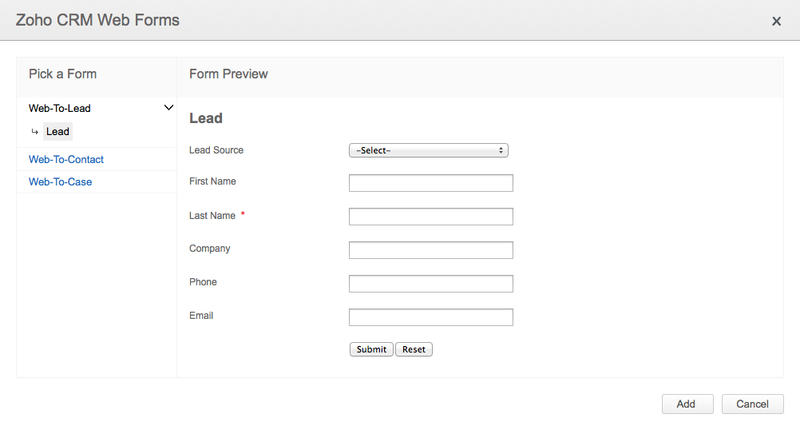 In the Web Forms page, choose Lead/Contact/Case tab and click Create New Form. 3. Drag and drop the required fields into your form and click on Next Step button. 4. In the Form Details page, enter a Form Name (eg. Feedback form, Data form, etc. ), enter the URL of the web page to which the visitor needs to be redirected once the web form is submitted. Specify a valid Return URL starting with "http://". This could be one of the page of your site. Also, enter the URL of the website where the web form is to be hosted in the Domain Name box. It should start with "http://". This could be your primary domain name prefixed with http://. This prevents spam and allows only forms submitted through the particular domain to be captured as valid information. 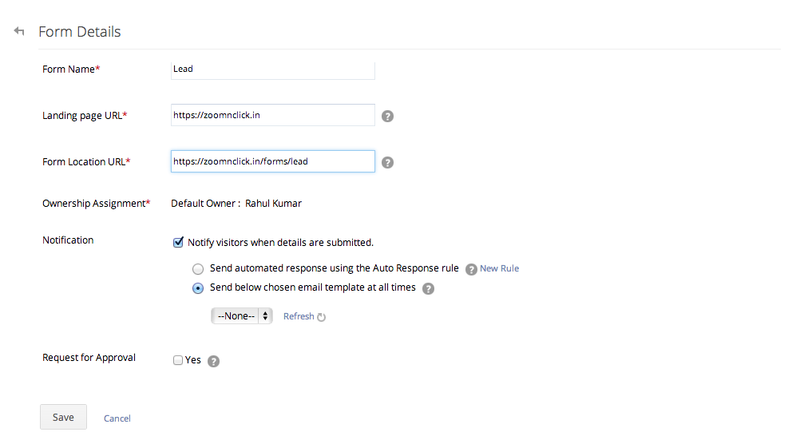 You can also set auto response rules for the CRM forms. 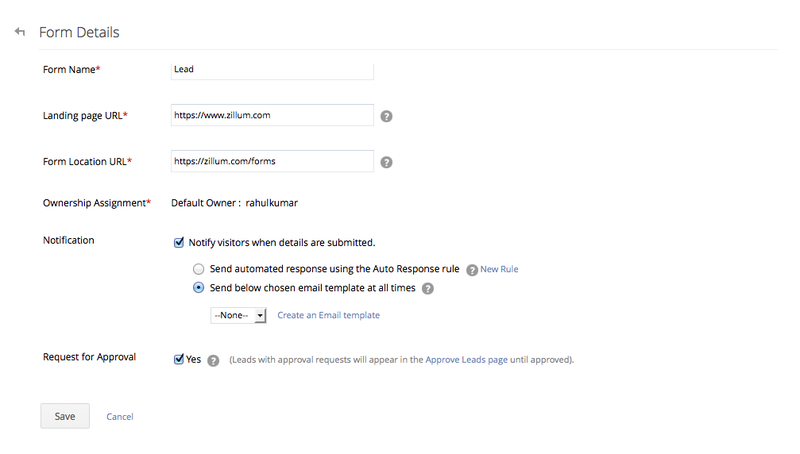 Auto Response Rules allow you to specify criteria that picks the required email templates to be sent when a record is generated through web forms. You can have only one active Auto Response Rule for a module. 1. Select the email template from the list. 2. 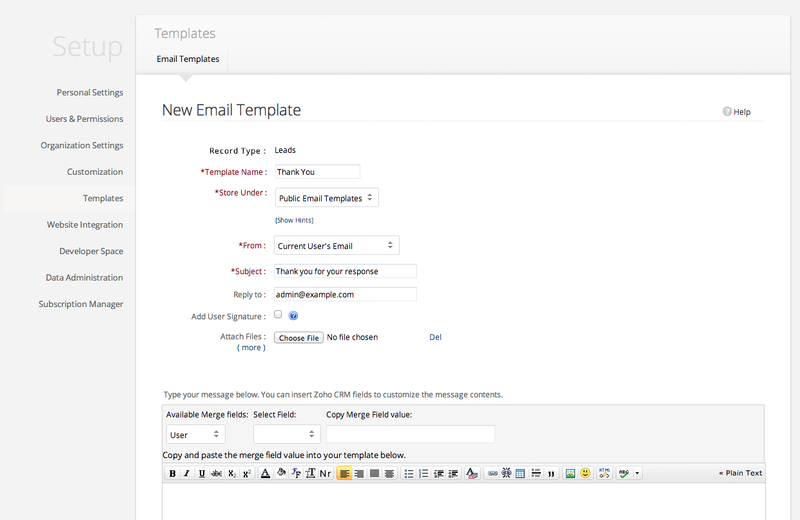 The template that you select will be used to send an auto-response email to the user who submits the form. When the details gathered through the web form does not satisfy the Auto Response Rule criteria, then the email template (acknowledgment email) selected while creating the web form will be sent. 3. Select the Notify Record Owner option to send an email to the owner, when a record is generated through your Website. The CRM Web form creation ends. You can now work on site builder by following Step 1 of this workflow. Every time your website visitor enters information, respective record is created in Zoho CRM, then user will be redirected to Return URL. An email will be sent to your visitor if you have enabled Email Acknowledgment. You can use Return URL page to thank your visitor.